In the 5 years since World IPv6 Launch, IPv6 deployment has grown over 3,000 percent! Now there are over 37 countries with more than 5% deployment of IPv6. In the USA, where I live, IPv6 deployment is up over 30% … sometimes close to 35%. These are all statistics out of the new “State of IPv6 Deployment 2017” report published by colleagues of mine at the Internet Society on this fifth “Launchiversary” of World IPv6 Launch back in 2012. A key point in the document is that enterprise networks are often the ones lagging farthest behind in deployment of IPv6. Mobile networks are far ahead in many locations, and residential broadband networks are also often very far behind. One reasons some enterprises struggle is that they have custom applications that need to be migrated to work on IPv6. That was really the reason why I originally wrote this very short book back in 2011 – to help developers understand what they need to be thinking about to move their apps over to work on IPv6. There are many more resources available in the time since I first wrote the book, including ARIN’s guide on “Preparing Applications for IPv6“. The key point coming out of this “State of IPv6 Deployment 2017” report today is that the time is now to make the move to IPv6! Start the migration… NOW! If you are trying to get your management or others in your organization to move ahead with IPv6, download this State of IPv6 Deployment 2017 report and send it around – or send the link around. Hopefully the information inside can help you make the case that the time to move to IPv6 is NOW. and start shopping. All you do is enter “CYBER16” as the promotion code when checking out. The deal expires on Tuesday, November 29, 2016 at 05:00 US Pacific Time. Do note that this sale is for ebooks and not for the print versions of the books or for print/ebook bundles. IPv6 deployment continues to grow fast – and new Internet standards may increasingly be focused on IPv6 – so the time is definitely here to make sure that your applications and networks are ready for the IPv6 Internet! DRM-free – no stupidity with license restrictions. P.S. My “Seven Deadliest Unified Communications Attacks” book is also on sale as an ebook at O’Reilly’s site… if you are interested in voice-over-IP (VoIP) security, please do check that book out, too. The IAB expects that the IETF will stop requiring IPv4 compatibility in new or extended protocols. Future IETF protocol work will then optimize for and depend on IPv6. This will not happen immediately, of course, but the IAB statement notes that levels of IPv6 deployment are increasing and that SDOs need to ensure that current and future standards can work in an IPv6-only environment. The key point for organizations and companies with applications is that you need to be seriously thinking about ensuring that your apps can work in IPv6-only networks. To prepare, I would of course welcome you to buy the book, but there are also resources available online that can help you get started. The important thing is to get started NOW! 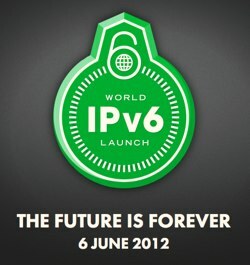 Today is the fourth anniversary of World IPv6 Launch, where in 2012 thousands of websites and hundreds of networks permanently enabled IPv6. I wrote about this anniversary over on CircleID and prominently mentioned that Google’s global IPv6 statistics just went over the 12% mark this past weekend. Up from 1% just 3.5 years ago (end of 2012). That’s a very remarkable growth rate and a clear sign that the transition to IPv6 IS happening, no matter what critics may say! Coupled with the fact that as of June 1 Apple is now requiring all iOS apps to work on an IPv6-only network… the situation is definitely clear that application developers need to understand how to make their apps work over IPv6 – and sooner rather than later. This book was obviously written to help, but there are other resources available now to help developers. The key point is to get started now! Before that 12% becomes 25% or 50% … and your app that only works on legacy IPv4 networks starts to have more challenges. Do it today! … and more! All you do is enter “CYBER15” as the promotion code when checking out. The deal expires on Tuesday, December 1, 2015 at 05:00 US Pacific Time. Do note that this sale is for ebooks and not for the print versions of the books. IPv6 deployment is accelerating – make sure that your applications and networks are ready for the IPv6 Internet! What I like about it is that he provides some of the motivation for why we need to care about IPv6. Some amazing percentages of IPv6 deployment in the February 2015 World IPv6 Launch measurements. As I wrote about on the Deploy360 blog, Verizon Wireless now is showing 56% IPv6 deployment and T-Mobile USA just crossed over 50% IPv6. If you read the notes on the bottom of the measurements page you can see that Google, Facebook, Akamai, LinkedIn and Yahoo! are all measuring the amount of the amount of IPv6 they are seeing to their sites and reporting that back to the World IPv6 Launch project. The key point for application developers is that all those people on those networks will be able to natively connect over IPv6 – if your application works over IPv6. And a reason for caring may be… speed! If a network is deployed with IPv6 in the main network, as I understand T-Mobile USA has now done, then connections from IPv6 clients can do directly to IPv6 servers. But connections to legacy IPv4 services will need to go through a gateway. Gateways typically introduce some degree of latency / delay, even at a microscopic level. If your application works with IPv6 then you won’t need to worry about any v6/v4 gateways with any potential delays. The reality that these measurements show is that IPv6 is very real today – will your app work over IPv6? … and more! All you do is enter “CYBERDY” as the promotion code when checking out. The deal expires on Tuesday, December 2, 2014 at 05:00 US Pacific Time. While you are there you can purchase any of O’Reilly’s other IPv6 books for the same discount. Do note that this sale is for ebooks and not for the print versions of the books. 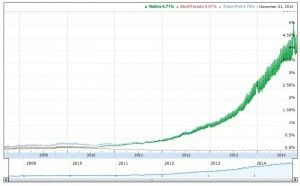 IPv6 Statistics Show Continued Growth – Have You Migrated Your Apps Yet? It is fun to watch the various IPv6 statistics sites because they continue to show the amazing growth of IPv6 around the world. 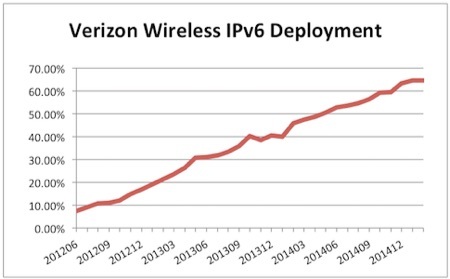 The World IPv6 Launch measurements now show Verizon Wireless’ network at 59% IPv6, T-Mobile USA at 43%, AT&T at 25%. Google’s IPv6 statistics show that traffic into Google web sites globally is about to hit 5%. And then today Akamai launched new IPv6 trend charts that show IPv6 traffic out of Belgium at 29.2%, from Germany 12% and from Luxembourg and the USA right at 10% with Peru not far behind. All of this shows that IPv6 deployment is very real! If you haven’t started migrating your applications so that they will work over IPv6 in addition to IPv4, why not? Obviously I’d encourage you to buy the book to help understand what you need to do… but you can also view the many IPv6 resources out there on the Internet to learn more! The key point is that you need to get started NOW! IPv6 is being deployed globally – will your application work over IPv6? 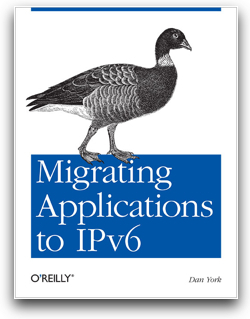 Want to buy “Migrating Applications to IPv6” at 50% off? (in ebook form) Or any of 8,000 other ebooks and videos? The folks at O’Reilly are having a “Back to (Tech) School Sale” that is in effect until 5:00pm U.S. Pacific Daylight Time on September 9, 2014. All you need to do is use the discount code “B2S4” when you are checking out. DRM-free – you can put it on as many devices as you want, and it’s yours. Notification of (free) updates – whenever I post updates to the book, you will be notified. It’s definitely worth it… I’m buying my tech ebooks directly from O’Reilly whenever I can now, simply because of these three points! Thank you for considering the purchase of this book – and please do let me know if you have any suggestions or feedback to help make it better. The entire point of the book was to help application developers be able to make their application work over IPv6… so I want to hear from you about how this book can help! This server has received 4034690 hits from both ipv4 and ipv6.